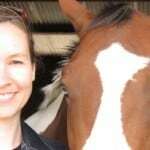 This past weekend, I attended the first Conference on Complementary Animal Healing in Boxborough, MA, organized by Maureen Harmonay of Animal Translations, and wanted to share my notes with you. We were around 40 people and 6 dogs who gathered on Sunday morning (the conference was Sunday and Monday, but I was only able to go on Sunday), and Maureen opened by talking a bit about how this event came to be and introduced the speakers. First out was Kathleen Prasad, who started by leading us in a guided meditation and then talked about her approach to and practice of Reiki. 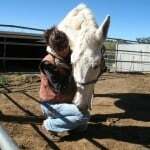 Kathleen talked about how important it is to do Reiki with the animals, rather than to them and to let them be our teachers and guide us. To never come at it with the mindset that you are here to do this and that and force Reiki on them, but rather just be there, offering the healing for them to receive if they wish. 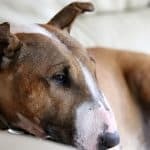 She also talked about the importance of remaining calm and positive no matter what the situation, and how you as the Reiki practitioner must try to keep a neutral mind while working on an animal, even if you might before the session have been angry about how they have been treated, or sad for them and their people when they are sick. 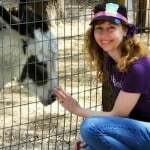 She also shared many amazing and very touching stories of her work with animals, and how many animals support each other, as well as humans, during difficult times and when passing on. It was all incredibly moving, and we were many who had difficulty holding the tears back. 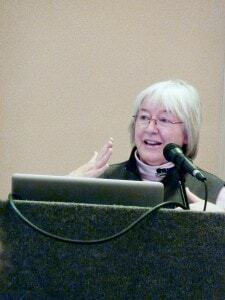 Next was Sally Morgan, whose morning presentation was about CranioSacral work with animals. 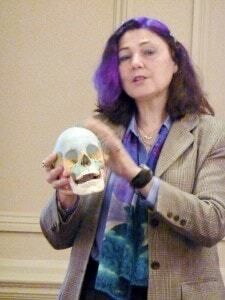 Sally talked about the history behind CranioSacral, how it works, and why it works. She also shared many funny and very interesting stories and images from her many years of practicing this work, such as dolphins doing craniosacral therapy on people using their sonar, a horse pinpointing the site of a problem on his human, and her own corgi, Comet (who was also present and added his own comments every now and then :-)), doing craniosacral work on other animals. After Sally came Nan Martin who talked about essential oils, and she mentioned something I hadn’t heard before – that the oils supposedly vibrate at certain frequencies (a good thing). Nan sent around some essential oils for us all to sniff, and did a demonstration on one of the dogs. After lunch, Kathleen once again led us in a meditation, this time to connect with a specific animal, and then shared tips for how to practice peace with our animals, how to do Reiki and also told several more amazing and inspiring stories. I have written in my notes “they should be teaching this to school children!” and what I meant by that is that if everyone were taught these techniques at a young age and kept practicing them – how to remain calm in the midst of chaos, to keep a positive mind, and to respect and connect with every life form – I am sure that this world would be a much more peaceful and compassionate place. After Kathleen, Sally Morgan spoke again, this time on vibrational healing, which I didn’t know a whole lot about, but it was fascinating, and now I want to try it! She talked about how the body and the different organs, as well as health and diseases, all have different frequencies, and when the frequency of the body goes down, you are more susceptible to disease, whereas high frequencies help prevent illness. For example, the human body is 62-78 MHz, the brain is 72-82 and the spiritual frequency goes all the way up to 365 MHz. Colds and flus are 57-60 MHz; when you’re down to 42 MHz, the risk of cancer increases, and death begins at 25 MHz. I was happy to hear that what has the highest frequency of anything are essential oils, with Rose topping the scale at 320 MHz. 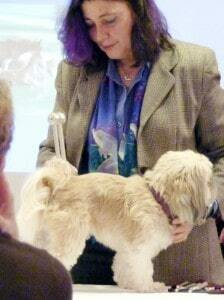 Vibrational healing uses tuning forks, which Sally said integrate both halves of the brain, just like TTouch does. You get the fork vibrating and then hold it on a specific spot on the body, or on a crystal (with the crystal touching the body). She demonstrated on one of the dogs, who seemed very happy with the treatment. 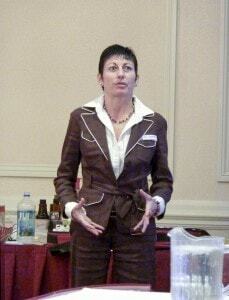 She also mentioned an 8th chakra on animals, which I hadn’t heard of before either, and must look into. Apparently it is located on their shoulders, and they connect with us humans through it. Maureen’s hope is that this becomes a yearly event, and I hope it does. 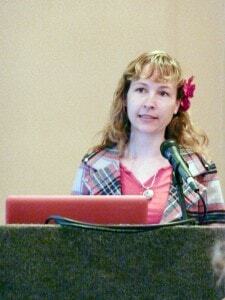 I really enjoyed the conference, and I met so many wonderful people (and dogs). It is a great opportunity to both network and learn a lot of new things, and I think it has endless potential.